Half a century after the assassination of President John F. Kennedy, someone is killing people on the streets of New York City and leaving behind a bizarre calling card of that tragic day in Dallas. 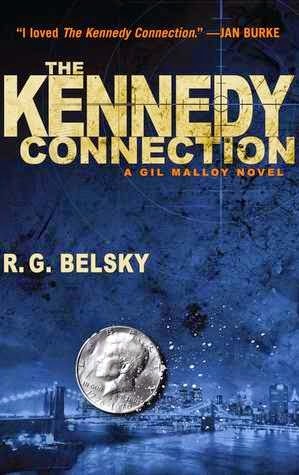 In this bold and entertaining thriller from a true media insider, discredited newspaper reporter Gil Malloy breaks the story of the link between seemingly unconnected murders—a Kennedy half dollar coin found at each of the crime scenes. At the same time, a man emerges who claims to be the secret son of Lee Harvey Oswald and says he has new evidence that Oswald was innocent of the JFK killing. Malloy, who has fallen from grace at the New York Daily News and sees this as an opportunity to redeem himself as an ace reporter, is certain there is a connection between the Oswald revelations and the NYC murders, but first he has to get someone to believe him. Convinced that the answers go all the way back to the JFK assassination more than fifty years ago, Malloy soon uncovers long-buried secrets that put his own life in danger from powerful forces who fear he’s getting too close to the truth. Two tales of suspense fuse into an edge-of-your-seat thriller as Malloy races to stop the killer—before it’s too late. WOW this book was amazing. The Kennedy Connection had more twists and turns than any suspense/mystery I have ever read, but boy I was on the edge of my seat the whole time. Gil Malloy is trying to pick up his life after a disastrous story that tore it apart. An old friend asks him to look into the death of a childhood friend. What starts as a story of trying to find redemption, by solving the death of a former gang member; ends with Gil finding himself and a new way to live his life. Gil is then given a story that will find a new ending to the JFK Assassination. However this whole adventure is just a cover up of the real story that Gil had uncovered. At first I thought this book would be just a rehash of old news, but the storyline takes you in a different direction. You get a great glimpse at a story that has been told many times over the last 50 years and gives you a possible different ending. But along with the assassination story, is the story of a man trying to find truth, not just about the death of a young man, but the truth of his own life. The Kennedy Connection is a fast paced, amazing book. R.G. Belsky weaves his tale in and out of the different story lines in this book, and in the end you get a great glimpse of a person who just wants to do the right thing. His characters are flawed, but people you would want to get to know. Even his villains are charming and charismatic, not evil and in the end they are human. I would recommend this book to anyone. Actually I would suggest you pick it up right away. I loved this book and as I said it was amazing. I thought it would be a carbon copy of the usual murder mysteries but this one wasn’t. R.G. Belsky is an author of crime fiction and a journalist in New York City. His new suspense thriller, THE KENNEDY CONNECTION, was published by Atria in August. It is the first in a series of books from Atria featuring Gil Malloy, a hard-driving newspaper reporter with a penchant for breaking big stories on the front page of the New York Daily News. The second - an eBook novella titled THE MIDNIGHT HOUR - will be published in February A third Gil Malloy book, SHOOTING FOR THE STARS, will come out in August 2015. Belsky himself is a former managing editor at the Daily News and writes about the media from an extensive background in newspapers, magazines and TV/digital news. At the Daily News, he also held the titles of metropolitan editor and deputy national editor. Before that, he was metropolitan editor of the New York Post and news editor at Star magazine. Belsky was most recently the managing editor for news at NBCNews.com - where he worked closely with Nightly News with Brian Williams, the TODAY show and oversaw all digital news content on the NBCNews website. His previous suspense novels include PLAYING DEAD and LOVERBOY.